The Second Life of Amy Archer is one those high-concept thrillers that seem to be all over the place at the moment. Beth Archer's daughter Amy went missing ten years ago from a London park, leaving Beth unable to move on or find any sort of peace. Shortly after the anniversary of Amy's disappearance, Beth is contacted by Libby, a much younger woman from Manchester, who claims that she knows where Amy is - and that she's still alive. The complication is that Amy is now called Esme, and in the ten years since Beth last saw her, she hasn't aged a single day. Can Esme really be the reincarnation of pretty, perfect Amy? Certainly she seems to know far more about Amy and her life than she could possibly have been coached to know from the newspapers. Beth, understandably, is simultaneously desperate to believe that Esme and Amy are one and the same, and yet struggles to believe that reincarnation could be possible. Can she trust Libby and Esme? What about Ian, a local psychic who claims to know something about the case? And how will Brian, Beth's former husband, now remarried with two more children, react? 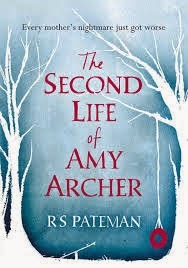 I can't deny that the basic premise of The Second Life of Amy Archer is an excellent plot driver, and the author's skill in characterisation really comes to the fore in Beth, a fascinatingly unreliable narrator consumed with guilt and grief. Just when we find ourselves wholly sympathetic towards her, there'll be a flash of mistrustful paranoia, a sudden mood-swing, a surprising judgement. There are times when every character in The Second Life of Amy Archer could be deceiving another, and this constant atmosphere of fearful uncertainty is one of the book's great strengths. The book's biggest fault lies with the ending - or rather, last one-fifth or so of the story. My issue with it is not any lack of resolution, but rather that it seems a little anticlimactic, a little out of equilibrium with the novel's structure. I could also find fault with some of the dialogue, which too often had a touch of the Radio 4 drama script about it rather than reading authentically as the speech of real, ordinary people. I also felt that there were a few things relevant to the mystery plot that were 'forgotten' only to be brought up all-too-conveniently later, which felt like a tiny bit of a cop-out. That said, it's an intriguing page-turner with a fascinating premise, and I'd happily read more by the same author.